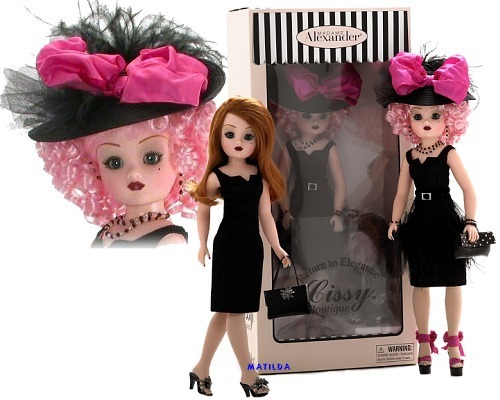 21" hazel-eyed Cissy steals the haute couture fashion scene day and night. Her daytime outfit features a black textured linen sheath dress, mules with starburst detail, matching purse, and long auburn wig (velcro used to attach to head). Nightime accessories include a pink curly wig (velcro used to attach to head), black velvet feather belt with rhinestone buckle, patent leather purse studded with pink rhinestones, platform sandals with pink wired ribbon straps, black hat with feathers and pink wired ribbon bow, earrings, necklace, bracelets, and a hat pin. Limited Edition of 250. Retired item - available for limited time.